Video: What are Library Databases and Why do you Need Them? General OneFile is a periodical resource with over 6500 full text titles, many dating back as far as 1980. It contains popular, business and professional journals, NPR audio files complete with transcripts, and Fodor's travel guides. EBSCOhost. Full text of general interest periodicals, reference and travel books, biographies, primary source documents, photos, maps, and flags. SIRS is a useful tool for getting ideas of topics to research. It includes a PRO/CON section with lots of viewpoints on current issues. Shop for a topic! Gale Virtual Reference Library Facts, statistics and explanations to help you understand a topic. Gale Virtual Reference Library contains encyclopedia entries that can give you a basic overview of your topic. Look here for basic information about biology, chemistry, nursing and medicine, sociology, history, education, law, and more. The first thing you should do when you have a research assignment is figure out what types of article sources are required or allowed. Some professors require you to use only scholarly peer-reviewed journals while others might let you use a variety of journals. Scholarly article - also known as peer-reviewed, academic, or refereed, these articles are written for researchers and experts and usually contain the results of a research study. Scholarly articles are written by experts in the field and are reviewed by peers who are experts in the same area. In many databases, you can limit your search to scholarly, peer-reviewed or refereed journals to weed out any non-scholarly content. Professional/trade article - written for people working in a specific field. Articles can be written by experts in the field or by staff writers. The articles are only reviewed by journal editors, so they go through a less rigorous review process. Popular journals - written for a general audience rather than for professionals or scholars and written by journalists. Examples include The New Yorker, People, and Rolling Stone. 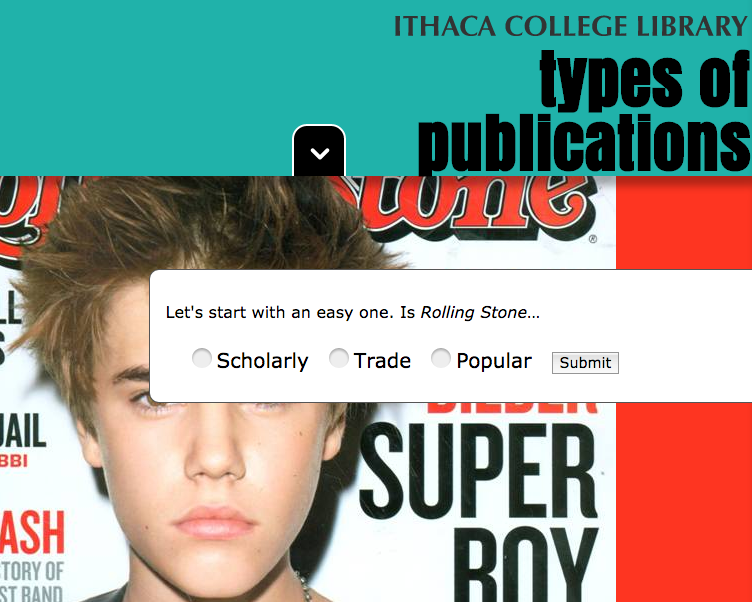 This quick quiz from the Ithaca College Library will test your knowledge and help you learn to tell the difference between different types of journals. When you use someone else's words, ideas, or images in your writing, you need to give them proper credit. Providing a citation or reference enables others to locate these sources, too! NCSU Citation Builder - walks you through the process of creating citations for a variety of print and online sources. Once your citation is created by filling out the forms provided, you can cut and paste your generated citation into your bibliography. Calvin College's Knight Cite - a citation creator that provides forms to help you make citations for a wide range of resources in print, online, and in multimedia and communication. Allows you to create a free Knight Cite account so you can save citations for later and export them to Word or an RTF document. MyBib - is a free online citation bibliography creation tool. It can create citations and bibliographies in many styles such as MLA 7 and 8, APA, Chicago, and more. MyBib allows you to paste in a website URL or even search for a book, article, or other source by title, and will pull most of the information you need to create a citation (though you may need to double check that the information is correct and complete). 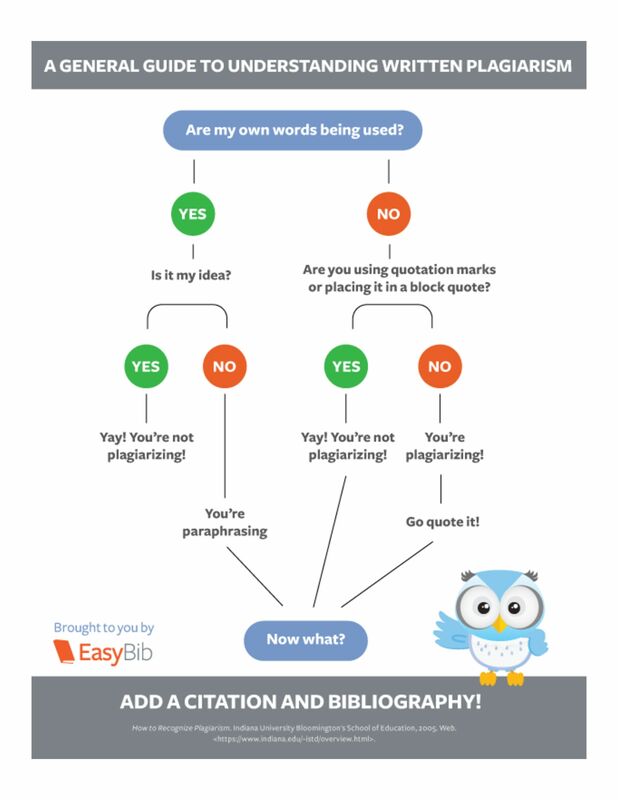 Once you’ve created your citations, MyBib allows you to copy paste your citations, download them as a Word document, save them to your Google Drive, print them, or email them to yourself. Need help with hanging indentation? Here is a link to a short video tutorial for hanging indentation formatting in Word. Here are some more tools to help you create APA and other style citations to cite your sources. Do you need to cite?